The articles, interviews, reviews and previews presented here are listed in chronological order, and cover Lee infront of the camera and in his personal life. The items have not been selected for accuracy or any particular merit and range from the sixities to present day. Items are not representative of the views or opinions of the site owners, unless specificlly stated as such. We want to give a Bionic 'Thank You' to everyone who has helped us bring you these articles, in particular Nancy and Hilary, for contributing, transcribing and just generally wanting to share their collections with fellow fans. Thanx guys! Copyright of all items remain with their original source/owner/author and no intention to superceed this is intended. * Lee on Mark & Mercedes - Source: Mark & Mercedes Morning show, 14th December 2007. * The Bionic Man Bounces Back - Source: Daily Express, 2007. 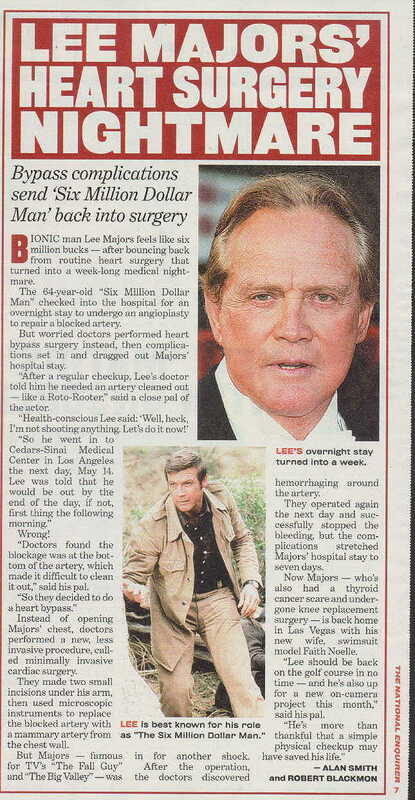 * Lee Majors: Finally his joints feel like Six Million Dollars - Source: Online Dec. 2002. * Lee Majors is Out Cold - Source etonline.com, Nov.2001. 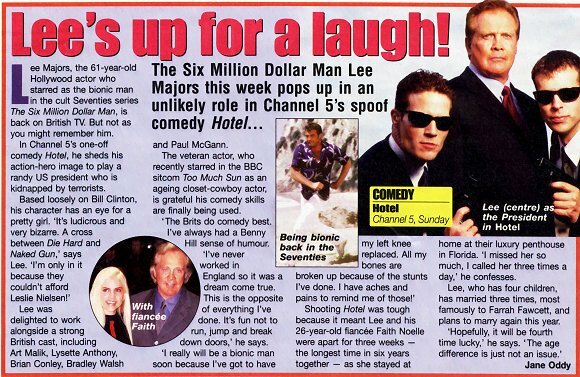 With thanx to Cubester..
* Now I'm the Ironic Man - Source TV Times, February 17-23 2001. * Lee's up for a laugh! - Source:UK TV listings magazine 2001. * Bionic? Not any more! - Source: What's on TV, October 14-20 2000. * Lee on ENTERTAINMENT TONIGHT - Source:ET Jan.18th.2000. Transcript & photo courtesy of Cubester. * The Hothead of Big Valley - Source: Australia TV WeekAugust 26 1967. * Film offers a trip back to the past - Source: Terry Pace, Times Daily. * BIG FAT LIAR Production Notes - Source: BFL Electronic Press Kit. * THE BIONIC MAN - Source:Total Film, Issue 44, Sept. 2000. * TV Titans - Source TVGuide Online April 2000. * Repeat After Me - Source:TVNow March 2000. * Lotto - Source: ?. * What took their bionic hearts so long to react? - Source TVGuide May 16 1987. * Behind the Scenes on FATE - Promo photo's and videos from Lee's 2003 thriller. * THE BIG VALLEY SEASON 1 DVD - Source: Personal site review, May 2006. * OUT COLD - the reviews - Source: various intenet web site. * BIG FAT LIAR - the reviews - Source: various intenet web site. * PRIMARY SUSPECT DVD review - Source: personal site review. * Worth Every Penny - Source:Ultimate TV. December 12th 1998. * Interview with Richard Anderson - Source: CultTV. * $6,000,000 Question - Source: Cult Times issue 22. July 1997.